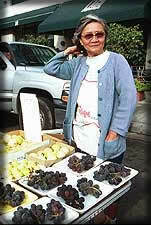 Grower Navarina Tolentino staffs her family farm's table at a Santa Monica market. 1. Members pledge to comply with the Associations Code of Ethics and Bylaws. 2. Members shall strive to reflect the highest principles of honesty, integrity and fairness in all of his/her dealings with other members and the public. 3. Members shall comply with applicable State and Local laws and regulations. 4. Members shall protect the integrity of certified farmers markets. They shall not engage in unfair business practices. Most importantly, members shall not engage in, or knowingly permit the practice of, buying and selling or commission sales of any kind. 5. Members shall require compliance with the Code of Ethics by persons employed or retained by them. It is the responsibility of members to educate and supervise employees such that they understand the importance of preserving the integrity of certified farmers markets. 6. Members are responsible for enforcing the Code of Ethics to the Association. Members should take adequate measures to discourage, prevent and/or correct the unethical conduct of other members. 7. Members acknowledge that the Association may inspect the accounts or points of production, storage, transportation, processing, packing and sale of products to verify that members are complying with the Code of Ethics and otherwise conducting selling activities honestly and fairly. 8. Members shall fully cooperate with an Association authorized investigation into any allegation that a member is not in compliance with the Code of Ethics and State/Local regulations. Members shall cooperate with the Association by providing the information it requests on selling activities, ownership arrangements and related matters. Depending on the severity of the alleged violation, cooperation may include, but not be limited to, making all business records and points of production, storage, transportation, processing, packing and sales of products available for inspection by the Association. 9. Members shall not make a false statement or provide false information in statements and filings to the Association. 10. Violation of any Association by law, guideline, code or policy may be grounds for fine, censure, suspension or expulsion from the Association. a. Only sell agricultural products at certified farmers markets that they have produced, except in those instances where a market allows a grower to separately display and sell the product of another grower as a second certificate. Growers who allow another producer to carry their product to market are equally responsible for complying with the Code of Ethics. b. Be members-in-good-standing of the Association in order to sell at Association member markets. c. Fully complete load sheets and accurately report their sales to the market. d. Sell only those products permitted by the market and in accordance with the market rules. e. Personally participate at markets as often as possible. Markets may give preference to those growers who actively attend the market. Growers or family members should personally appear at least once each quarter at any market where they are engaged in selling activities. f. Not make false claims in advertising their products in such areas as product quality, cultural practices and sources. Growers shall not sell graded, inferior grades of produce unless they are clearly labeled as such. g. Have a special obligation to avoid even the appearance of impropriety in their selling activities within a certified farmers market if 1) they engage in buying and selling of products produced by others for sale outside of certified farmers markets (including wholesaling and the use of packing houses, distribution centers and similar facilities) and/or 2) they engage in farming outside of California. They may be subject to regular inspection to prevent the suspicion of engaging in buying-and-selling activities. a. Operate their market as a service to the community and in a manner that will support the earning opportunities of certified producers. b. Strive to select new growers or products for the markets in such a manner as to preserve as best they can the earnings opportunities of existing producers. c. Only permit certified producers who are members-in-good-standing of the Association to sell at their markets. d. Primarily benefit consumers with quality produce from certified producers with lesser emphasis on handicrafts and/or hot food vendors. e. Be vigilant in enforcing these standards at the markets. f. Not accept a payment, gratuity or gift from any producer for the opportunity to participate in a market. g. Clearly indicate the boundaries of the certified farmers market with signs that are clearly visible to consumers. h. Annually review their outreach and education programs and share ideas with other member markets. i. Prepare and provide an annual report of revenues and expenses to the Association. j. Accurately report sales and forward membership fees to the Association in a timely manner.